A pretty cool movie about seedy scandals and dark voodoo in a swamp town down in Louisiana. This is a clever and interesting movie that actually serves as a sort of mystery / seedy noir. It’s about a man who is caught having an affair by his youngest daughter, and how that daughter’s telling of what she saw to her older sister causes a long chain of events. What really makes this movie work is the story of voodoo and fortune telling that works its way in on a number of occasions. The background and setting here really work to the movies advantage, with some fantastic shots of the swamps, and uses of location to mix in with the story. The movie gets going from very early on, has a pretty cool story, and a fantastic environment. It’s something different, and definitely something cool. 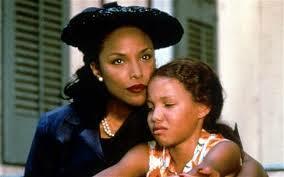 Eve’s bayou is a very interesting and even unusual movie. The unusual part comes mostly because of the location and things that go with it, as opposed to the story itself. 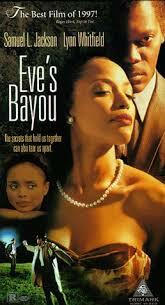 This film takes place in the swamps of Louisiana, and unlike other movies that take place in similar locations (such as Beasts Of The Southern Wild), or movies that would use this location just for the nature shots, and not to do any storytelling (if you can imagine a Terrence Malick movie in this setting), eve’s bayou does both. It tells an interesting and captivating story, while also giving us some of those quick scenic shots from time to time. The movie starts off with some major plot elements right away. First there’s the voice over of a little girl telling us that this is the story of how she killed her father. So we already know what is going to happen. But then we cut to a party, meet all the interesting characters in the room, and end up seeing an affair in action. This is all in the first fifteen minutes or so of the movie. That’s a lot to establish quickly, and the movie does a nice job with it. First it has to establish who all the characters are and whom they are married to, before it can show us that one of them is having an affair, and allow us to know exactly what’s happening. The movie is able to do all of these things. It also is able to hold back introducing the father, played by Samuel L. Jackson, until nearly every other character at the party has been briefly introduced. We know that Sam Jackson is the star of this movie, and so we look forward to seeing him make his appearance on the screen. The movie uses that anticipation to its advantage, introducing the other characters first, so that by the time Jackson is introduced, the real story is ready to get rolling. That story begins with young eve, the little girl from the opening voice over, falling asleep in a carriage house and witnessing her father, Louis (Jackson) going at it with a woman named Mattie Mereaux. Now we have already met Louis’ wife, Roz, (played by Lynn Whitfield), as well as their older daughter, Cicely, who is fourteen. When eve sees this happening in front of her, she doesn’t stay quiet, and go unnoticed. Instead, she gets herself caught by her father, who comforts her. That night, however, eve goes upstairs and tells Cicely what she saw, and Cicely has another take on what was happening. Cicely tells eve that their father had told Mattie Mereaux a joke, and Mattie was just falling into their father, laughing. That’s what eve saw as them rubbing up against each other, and touching each other. Eve doesn’t know if she believes Cicely, but she goes along with it for the time being. All is forgotten for a little while, as we start to get into the story of Louis’ sister, Mozelle. She has been married three times, and all three of her husbands have died. Mozelle is a fortune tells, and she believes that she is cursed. She will never be able to find love and marriage at the same time, without her husband dying. She starts up a relationship with a man who comes to visit, in search of his wife, and when the man tells her that he loves her and wants to marry her, Mozelle has to push him away, saying that she cannot allow a man to marry her anymore, because of what she knows will happen to him. The next big event happens when Mozelle and Roz are out walking one day, and stop by an old woman voodoo fortuneteller with a white face. This woman has a booth setup in the town market, and is more like a gypsy. It’s funny how this woman basically does the same thing as Mozelle, only in a much different way. Mozelle’s way is more classy, having her customers come over and sit down at a table. With this white-faced woman, she has them dump out a bag small animal bones, and the way that they are arranged, when they get dumped out, tells her something. She tells Roz that there will be a horrible accident where a child gets run over in the street, and dies. Roz freaks out over this information and puts her kids on house arrest. Cecily sneaks out one day, in a rainstorm, and goes to see her father at work. Maybe she wants to check up on him and see if what eve told her is true. She wants to catch him with another woman. When she comes back home, her mother slaps her, and Cecily is never really the same. As it happens, it isn’t so much the slap that changed Cecily, but everything that came after it. That night, her parents have a big argument downstairs. It’s either that Cecily caught her father with another woman, or just that the whole town knows about what the father is doing. Either way, we learn later on the truth about what happened that night, and what Cecily’s involvement was with her father. By the end of the movie, everything comes together. That includes the white-faced woman fortuneteller, who eve ends up going to for help, as well as the Mattie Mereaux affair that began the movie. Eve is angry about what happened to her sister and takes matters into her own hands. The result is the moment we’ve been coming to expect since the beginning of the film, and yet it is still climactic and exciting. There are a lot of great things about this movie, including a story that keeps movie forward with new events and revelations. I like the twist ending, involving Cecily. What I don’t like is that the movie gives away it’s ending from the very beginning of the film, with voice over. That could have worked much better as a surprise. I also would have liked to see a little more about from the women characters. We aren’t allowed to get into Roz’s story very much, and it would have been nice to see her address her husband and the affairs at one point, or how she found out about them. For Mozelle, it would have been nice to find out more about her dead husbands and exactly how they died. While the movie could have been a little better in certain ways, it still did a lot right, and was a very clever film.